We know from responses to our previous articles that there are many, many readers waiting for the Samsung Galaxy Note 3. This phablet style of smartphone is expected later this year, and we are hoping to see it revealed at IFA 2013 in Berlin, which takes place in September. Until then though, we can whet our appetites with a very realistic look at a Samsung Galaxy S3 with a larger display. Although we think it more likely that the flagship Galaxy Note 3 will launch in fall, we should point out that there are many people hoping it may be introduced at a Samsung event being held in London on June 20. This doesn’t seem very plausible, and we think this event may reveal the Samsung Galaxy S4 Mini instead, although that doesn’t stop us hoping for more! We’ve already shown readers a concept design by Deepak Ahuja of the Galaxy Note 3 with a flexible display and now the same designer has come up with an impressive but realistic design for the Galaxy Note 3 with a larger 6.33-inch display. Earlier today we gave readers news about a Galaxy Note 3 code spot and gave some details of rumored specs so far. A 5.99-inch display has been speculated as well as a larger 6.3-inch display and Ahuja has focused this design on the bigger of the two possibilities. Ahuja’s specs include a 6.33-inch Full HD Super AMOLED Plus display and a 2GHz 8-core processor comprising a 1.7GHz ARM Cortex A15 with a 1.2GHz ARM Cortex A7. Other specs include 3GB of RAM, 16, 32 or 64GB of internal storage, a 13-megapixel rear camera with LED flash, 2-megapixel front-facing camera with BSI and CMOS and a sizeable 3550 mAh battery. The design of this imagined Galaxy Note 3 is also pretty impressive with very small bezels and weighing around 143g. We actually think that this is what many people would like to see the real Samsung Galaxy Note 3 look like when it is finally revealed and would be interested to see if you agree. 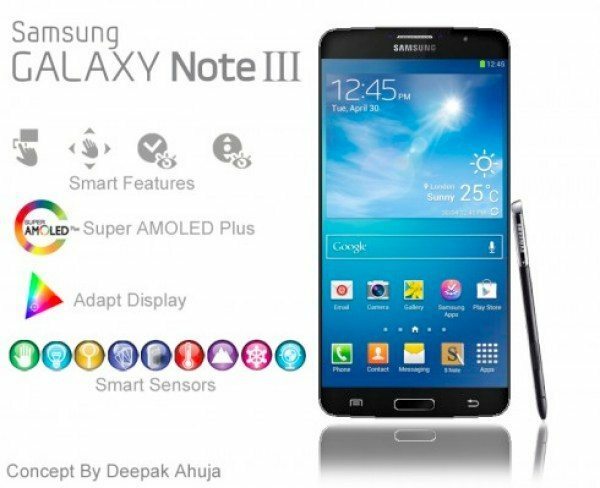 What are your thoughts on this concept Galaxy Note 3? Would this suit you just fine, or would you prefer the device to have a 5.99-inch display? Could the size be a deal breaker for you? Let us know with your comments. The bigger the better and 6.33-inch with edge-to-edge screen and minimal bezel can easily fit into the same external dimensions as the Note 2 or even a bit less. Concept wastes too much space at the top and bottom. Like the 5.5 now on Note 2 but 5.9 is ok. 6.3 is too big. HOPEFULLY. 5.9 is what the Note 3 will be. I’ve said many times give us more battery life and faster processor and better screen in daylight and keep everything else the same as the Note 2. You will outsell the S4!!!! Go BIG or Go HOME! I’m waiting for fall to compare the Google Nexus 5 phone against the Note 3. Not sure which one to buy yet. Will have to wait it out I guess. I hope they’ll have a dedicated team for Galaxy Note updates. That’s my only concern. Can’t wait for the phablet to come out though. I wish it was shown in perspective with a phone that it’s already out. I may not be in the majority but I’m afraid it may be too big. Why do we keep seeing these ‘concept’ images being used in the context of what the phone might look like? Why does it say 2ghz 8 core but the A15 is stated as being 1.7ghz and the A7 at 1.2ghz? Anyway, that would be fine as long as it has the 3GB of RAM. And hopefully the carriers won’t use it as an opportunity to cram more bloatware.